If a conservative or Republican uttered the nonsense to be revealed shortly, we'd justifiably never hear the end of it on the late-night comedy shows and elsewhere. As it is, former car czar Steve Rattner's "creative" term for fibbing has and probably will continue to get little coverage outside of Detroit. General Motors Co. Chairman and Chief Executive Ed Whitacre may have stretched the truth in a commercial saying the automaker had repaid its federal obligations, former autos czar Steve Rattner said today. 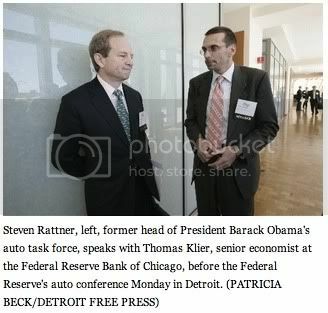 GM "may have slightly elasticized the reality of things," Rattner told reporters ahead of a speech today. But he also praised Whitacre. "We should all wake up and thank God we have him. The guy's a hero," Rattner said. Rattner said GM has signaled to the market that it will report a profit for the first quarter next week. GM touted its repayment of $6.7 billion in federal loans -- but downplayed the fact that the taxpayers are still on the hook for $43 billion in aid that was swapped for a 61 percent majority stake in GM. Rattner, who was President Barack Obama's auto czar last year, returned to Detroit on Monday a year after Chrysler's bankruptcy filing, and talked about why the government saved the auto industry. Rattner, who is writing a book on his work as auto czar due out in October, touted progress that GM and Chrysler have made following the government's controversial $62 billion bailout. Funny, the bailout price tag cited by the Time a year ago was "$80 billion and Growing" to a possible $100 billion. What happened? And from what I can tell, Time's tally doesn't even include anywhere near all of the potential losses at GMAC, which, at $17.29 billion and counting, is turning into a miniaturized version of the Fannie Mae/Freddie Mac sinkhole. The thing to watch for is whether it comes from domestic/North American operations or from elsewhere. My guess is "elsewhere." The company sat on a hoard of cash from the government that overstuffed it so that (it is hoped) it can't fail again. Tens of millions of dollars in interest income that have nothing to do with the profitability of operations might be what actually puts the company over the top. If GM were a publicly held company (as opposed to a government-owned entity), it couldn't "signal the market" as described. There is no market for GM stock, as it isn't traded. The company's position is that it does us a favor by telling us anything at all about its finances, because as a "private entity," it doesn't have to reveal anything. The Associated Press's Tom Krisher and Tim Martin didn't even mention the Whitacre ad controversy, let alone bring up the former car czar's stretchy word. Relative bit player UPI.com did cover Rattner's pre-speech statement, and brought out Rattner's new E-word in its first two paragraphs. The Detroit Free Press's Brent Snavely and Chris Christoff got to Whitacre's whoppers in Paragraphs 7 through 9, and did quote Rattner's use of the E-word. The New York Times has no coverage of Rattner's appearance, nor does its DealBook Blog. Business Week didn't bring up the ad matter at all, but did have an interesting quote about the prospect of first-quarter profitability from auto industry consultant Dennis Virag -- “Whitacre has come out several times and said GM expects a profit for the year. ... He didn’t predict a first- quarter profit, but I don’t believe he would be talking about profits if he didn’t expect to post one." Really, Dennis? Whitacre was perfectly willing to talk about a "bailout paid in full" when there wasn't one.